This article is about the card. For the character, see Characters#Almalexia. Almalexia is a unique legendary Endurance creature card. It is part of the Houses of Morrowind expansion. "I call upon you to serve me once more." "I am the light of Morrowind." "They attack my children, they attack me." This card's exalt ability applies the Sacred Lady card effect. 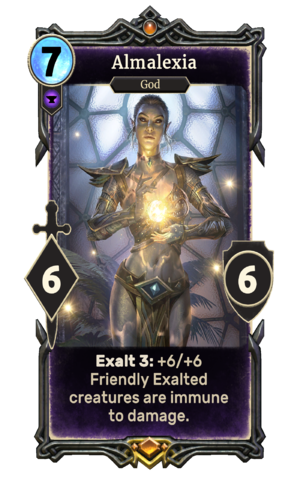 Almalexia first appeared in Morrowind's Tribunal expansion, and later reappeared in ESO. "Rage consumes me! The Maulborn invade my home. They attack my children. They attack me! You have proven yourself loyal and capable. I call upon you to serve me once more." This page was last modified on 2 March 2019, at 00:57.